Single breakdown can't block the way. A Line is a sequence of connected track-blocks (schema 6.1). Two line way is the way, where tracks are two parallel lines, with traffic in both the directions is possible. Possible line-changers are represented on schemas 6.2, 6.3 and 6.4. On schema 6.2 a tunnel is used for that, on schemas 6.3 and 6.4 a bridge is used. The difference consists in number of cells (tracks) between signals on the ends of tracks. All the line-changers work the same way. Train, comming from one side of the line-changer A, will keep on the way B, if its way is free, and will change it using C, if not. 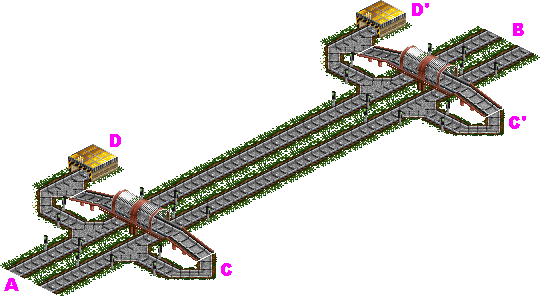 If other train comes to the changer, while the first one changes the way, the first train will use depot D to wait. Depot D is also used for train service if its time has come. A group of track-blocks, united with a line-changers, makes a way (schema 6.5). 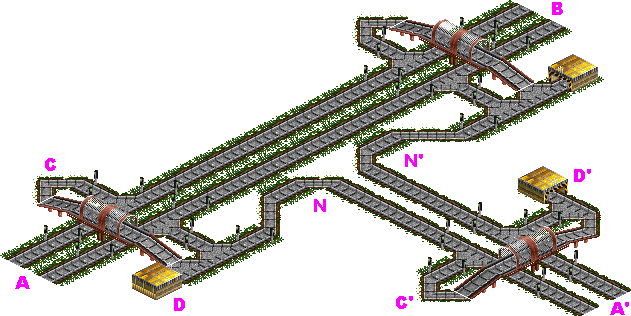 A track-blocks extension depends on the number of trains, which use the way and their speeds. Less trains or/and higher speeds - longer blocks. In case, when one direction movement has a priority, a priority routing is used (schema 6.6). The priority routing becomes very useful on a short distance and a heavy traffic. Usually, it's used on coal or goods consists - situations, where cargo can be transported only in a one direction and/or a higher speed is required. The algorithm of the functioning is very simple - a train from A goes to B normally, a train from B to A autocratically goes to depot E(F). Now, let's find out, how does two-line ways can be connected. First off all, let's have a look at connected intersections, represented on schemas 6.7 and 6.8 (non-connected intersections would not be overviewed). 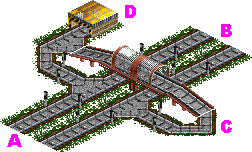 They can be build using tunnels (schema 6.7) or bridges and can connect ways on the same and different levels (schema 6.8). All of them are working the same way. The tracks-block of the AB way is located over/under tracks-block of the way A'B' and is connected at the nearest line-changers (e.g. C) to the line-changers of the other way (e.g. C'). A line-changer's depots (e.g. D, D') is used both on line-changers and ways from one way to another (blocks N, N', N'', N''). As an example, let's analyze the behavior of the trains, that comes from A depending on it's destination. If a B' is the destination, the train from A tries to go through block N' (using C if necessary). But, if the block is busy, it can go through blocks N''' or N or even through blocks N, N'' and N'''. 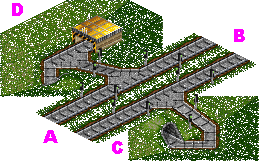 If a A' is the destination, the train from A tries to go through block N (using line-changer C if necessary). But, if the block is busy, it can go through blocks N' or N'' or even through blocks N', N''' and N''. And if even B is a destination, the train can also use blocks N-N'' or blocks N'-N''' to achieve his destination B. Now, let's have a look at T-junctions. They can be build two ways. Standard way (schema 6.9), there the each line of the one way is connected to one of the lines of the main way. 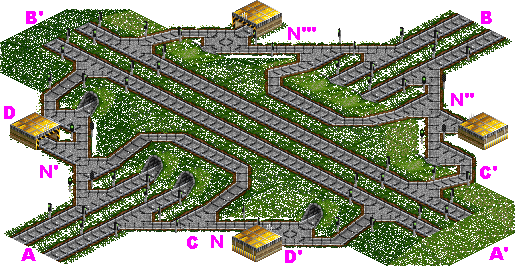 Additionally, the line-changer C' of the connected way is connected to the nearest line-changers of the main way through two blocks (N and N'). 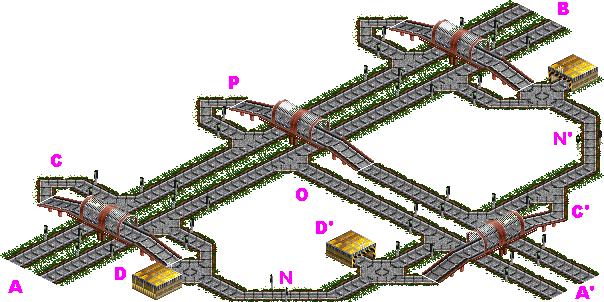 This construction converts the the connected parts of the way into buffers O and P, because blocks N and N' are used as the main ways. Additionally, they have a length, which allows a train to wait on them, without blocking other lines. Such a construction gives the train four methods to come to one way from the other. A simple way, where each of the lines of the connected way is connected to the line-changer of the main way, is represented on schema 6.10. It gives the train only two methods to come to one way from the other. Blocks N and N' are the only way for a train to go. Used in cases with a small traffic on the connected way A'.